This week I will be reviewing Mac Rogers’ play Frankenstein Upstairs, which according to the press materials transplants the Frankenstein story into a contemporary Brooklyn apartment building. As the title suggests, the main characters are Dr. Frankenstein’s downstairs neighbors. This crafty slant doesn’t come as much of a surprise to me; I’ve been covering Rogers’ work for a couple of years now and have found that one of his primary strengths as a playwright (and specifically as a writer of science fiction) is perspective. As part of the mission statement for this site, I hope to provide a better context for appreciating indie theatre artists by “pre-gaming” with some thoughts on their earlier works before each review. For this first series of Pre-Games I’ll talk a little about the Mac Rogers plays I’ve covered before and how perspective figures into each of them in a central way. 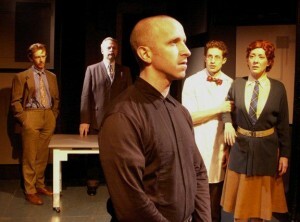 My first experience with Rogers was his play Universal Robots, which I reviewed for OffOffOnline in 2009 when it was presented it at Manhattan Theater Source by Gideon Productions (a company Rogers co-founded). I’ve been reviewing plays in New York since 2005 and over the years many of them, especially from those OffOff days, have simply drifted out of my head, leaving me to confront the published reviews with disbelief. Did I really see that? And write 800 words about it? 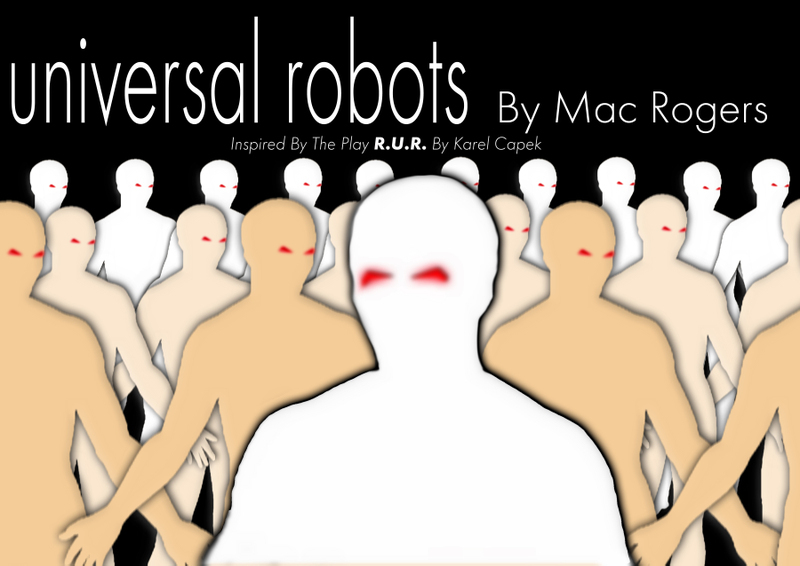 At the other end of the spectrum, there are plays like Rogers’ Universal Robots, which adventurously revised Karel Capek’s 1921 play R.U.R. and raised enough substantial ideas in its sweeping alternate history framework that I have never fully escaped its pull. Any with proper sci-fi bona fides will have heard of the Czech playwright’s play before, most likely as a footnote in a biography of someone like Isaac Asimov, where it is always dully credited as the first usage of the word “robot.” (In fact, the unabbreviated English title is Rossum’s Universal Robots.) Rather than merely modernize and retell the dusty old story of R.U.R. for a contemporary audience, Rogers instead inventively mined the specific circumstances of its creation – the playwright Capek, the region of Czechoslovakia and the Pre-World War II time period – to serve as centerpieces within his narrative. This was a deft transposition that gave Rogers some runway to consider the idea of sentient humanoid robots in a familiar political context. Rather than some vaguely defined “not-too-distant future,” the creation of Rogers’ automatons occurs quite specifically on the eve of World War II in Czechoslovakia – as Carl Sagan might say, a moment when leverage on the future was high. In Rogers’ story the Czech president, counseled by a Jewish member of FDR’s staff, eventually deploys an army of robots into Germany to preemptively eradicate the growing Nazi menace, thus preventing years of war and establishing the robotically armed Czechoslovakia as the world’s foremost super power; you see, the Czech robots massacred not just Nazis, but also innocent German citizens. The spectacular Jason Howard starred as the robot Radius, a startlingly compelling point of view character through whom we see the various phases of the synthetic mental and emotional development of the robots, including when he returns from Germany with a terminal cognitive malfunction that looks a lot like PTSD. That Capek (David Ian Lee), his crusading sister Jo (Jennifer Gordan Thomas), and their bohemian coffee shop pals are made members of Czechoslovakia’s ethical committee on the treatment and usage of robots early on is a stretch, but a worthy one. Rogers, whose play delicately picks its way through the morals of weighty issues like genocide, slavery, the preemptive use of military power, and the very definition of consciousness, needed to ground his observations in an outlook similar to his own. Capek the activist artist – a playwright, no less! – proves to be a perfect lens through which to observe Rogers’ parallel version of the 20th Century. In 2009 I didn’t care for the conceit that the play itself was a group of “actor robots” retelling the story of how they rose to power, but now I can’t help but find it a little charming and even touching, when considering how it serves as an amplification of Capek’s role in the piece – the robots have learned that the artist’s view of history is a valid and vital one.